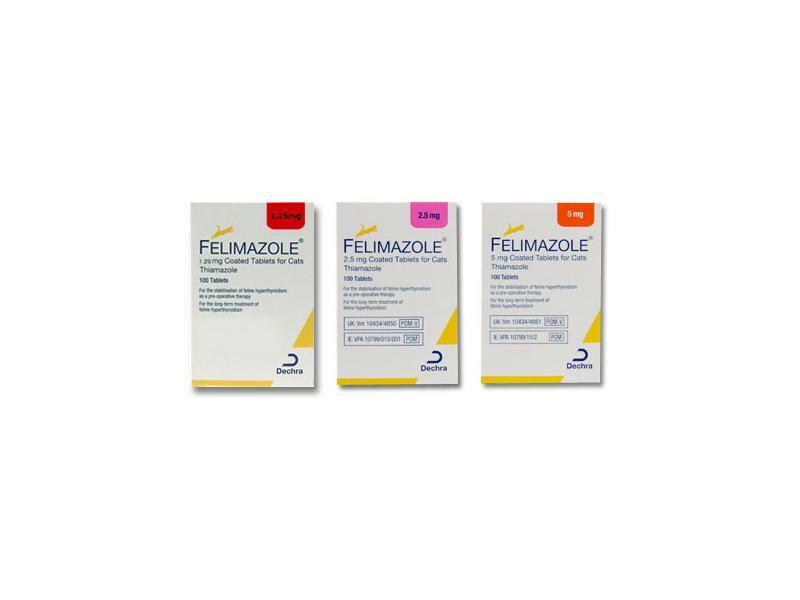 Felimazole is a medication for cats which is used to treat hyperthyroidism. This is a condition which affects mainly older animals and relates to the over-activity of the thyroid gland. The medication controls the amount of hormones released by the thyroid gland. A cat that has an overactive thyroid may suffer a number of other medical problems as well, such as high blood pressure, a fast heart rate, extreme weight loss and eye problems. If the condition is not treated then the cat may suffer problems with the heart or other organs, blindness and a reduced life expectancy. Felimazole are small tablets which are sugar coated. They are intended to be administered via the mouth, though this is sometimes hard to do with cats so they can also be added to food. Most cats will not suffer any side effects from Felimazole and will improve a great deal while taking it. A minority of cats have suffered some side effects such as itchiness around the head and neck which can lead to skin damage from excessive scratching. If more serious side effects are suspected then the cat should be examined by a vet. Those handling the drug should always wash their hands after doing so. A pet prescription is required to obtain this medication. The drug is available from your vet but usually works out cheaper if obtained from the online supplier VioVet. Your vet must provide a written prescription which can be posted, faxed or emailed to us before the drug can be supplied. 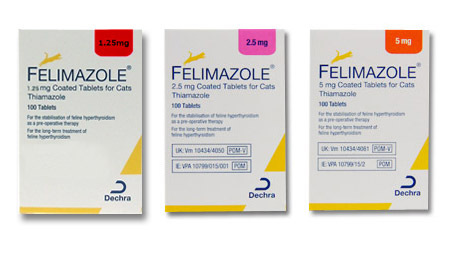 Felimazole 1.25 mg coated tablets for cats: Red sugar-coated biconvex tablets, 5.5 mm diameter. Felimazole 2.5 mg coated tablets for cats: Pink sugar-coated biconvex tablets, 5.5 mm diameter. Felimazole 5 mg coated tablets for cats: Orange sugar-coated biconvex tablets, 5.5 mm diameter. For the stabilisation of hyperthyroidism in cats prior to surgical thyroidectomy. For the long-term treatment of feline hyperthyroidism. Do not use in cats suffering from systemic disease such as primary liver disease or diabetes mellitus. Do not use in cats showing signs of autoimmune disease. Do not use in animals with disorders of white blood cells, such as neutropenia and lymphopenia. Do not use in animals with platelet disorders and coagulopathies (particularly thrombocytopenia). Do not use in cases of hypersensitivity to thiamazole or the excipient, polyethylene glycol. Do not use in pregnant or lactating females. Please refer to Use during pregnancy and lactation. If more than 10 mg per day is required animals should be monitored particularly carefully. Use of the product in cats with renal dysfunction should be subject to careful risk:benefit assessment by the clinician. Due to the effect thiamazole can have on reducing the glomerular filtration rate, the effect of therapy on renal function should be monitored closely as deterioration of an underlying condition may occur. Haematology must be monitored due to risk of leucopenia or haemolytic anaemia. Any animal that suddenly appears unwell during therapy, particularly if they are febrile, should have a blood sample taken for routine haematology and biochemistry. Neutropenic animals (neutrophil counts <2.5 x 109/l) should be treated with prophylactic bactericidal antibacterial drugs and supportive therapy. As thiamazole can cause haemoconcentration, cats should always have access to drinking water. Please refer to Amounts to be administered and administration route for monitoring instructions. In the case of accidental ingestion, seek medical advice immediately and show the package insert or the label to the physician. Thiamazole may cause vomiting, epigastric distress, headache, fever, arthralgia, pruritus and pancytopaenia. Treatment is symptomatic. Wash hands with soap and water after handling litter used by treated animals. Do not eat, drink or smoke while handling the tablet or used litter. Do not handle this product if you are allergic to anti-thyroid products. If allergic symptoms develop, such as a skin rash, swelling of the face, lips or eyes or difficulty in breathing, you should seek medical attention immediately and show the package leaflet or label to the doctor. Do not break or crush tablets. As thiamazole is a suspected human teratogen, women of child-bearing age and pregnant women should wear gloves when handling litter of treated cats. Pregnant women should wear gloves when handling the product. Adverse reactions have been reported following long term control of hyperthyroidism. In many cases, signs may be mild and transitory and not a reason for withdrawal of treatment. The more serious effects are mainly reversible when medication is stopped. Adverse reactions are uncommon. The most common clinical side effects that are reported include vomiting, inappetance/anorexia, weight loss, lethargy, severe pruritus and excoriations of the head and neck, bleeding diathesis and icterus associated with hepatopathy, and haematological abnormalities (eosinophilia, lymphocytosis, neutropenia, lymphopenia, slight leucopenia, agranulocytosis, thrombocytopenia or haemolytic anaemia). These side effects resolve within 7-45 days after cessation of thiamazole therapy. Possible immunological side effects include anaemia, with rare side effects including thrombocytopenia and serum anti-nuclear antibodies, and, very rarely, lymphadenopathy can occur. Treatment should be stopped immediately and alternative therapy considered following a suitable period for recovery. Following long-term treatment with thiamazole in rodents, an increased risk of neoplasia in the thyroid gland has been shown to occur, but no evidence is available in cats. Laboratory studies in rats and mice have shown evidence of teratogenic and embryotoxic effects of thiamazole. The safety of the product was not assessed in pregnant or lactating cats. Do not use in pregnant or lactating females. Concurrent treatment with phenobarbital may reduce the clinical efficacy of thiamazole. Thiamazole is known to reduce the hepatic oxidation of benzimidazole wormers and may lead to increases in their plasma concentrations when given concurrently. Thiamazole is immunomodulatory, therefore this should be taken into account when considering vaccination programmes. For the stabilisation of feline hyperthyroidism prior to surgical thyroidectomy and for the long term treatment of feline hyperthyroidism, the recommended starting dose is 5 mg per day. Wherever possible, the total daily dose should be divided into two and administered morning and evening. Tablets should not be split. If, for reasons of compliance, once daily dosing with a 5 mg tablet is preferable, then this is acceptable although the 2.5 mg tablet given twice daily may be more efficacious in the short term. The 5 mg tablet is also suitable for cats requiring higher dose rates. 1.25 mg tablets are intended for use in cats that require particularly small doses of thiamazole, and to assist with dosage adjustments. Haematology, biochemistry and serum total T4 should be assessed before initiating treatment and after 3 weeks, 6 weeks, 10 weeks, 20 weeks, and thereafter every 3 months. At each of the recommended monitoring intervals, the dose should be titrated to effect according to the total T4 and to clinical response to treatment. Dose adjustments should be made in increments of 2.5 mg and the aim should be to achieve the lowest possible dose rate. If more than 10 mg per day is required animals should be monitored particularly carefully. The dose administered should not exceed 20 mg/day. For long term treatment of hyperthyroidism the animal should be treated for life. In tolerance studies in young healthy cats, the following dose-related clinical signs occurred at doses of up to 30 mg/animal/day: anorexia, vomiting, lethargy, pruritus and haematological and biochemical abnormalities such as neutropenia, lymphopenia, reduced serum potassium and phosphorus levels, increased magnesium and creatinine levels and the occurrence of anti-nuclear antibodies. At a dose of 30 mg/day some cats showed signs of haemolytic anaemia and severe clinical deterioration. Some of these signs may also occur in hyperthyroid cats treated at doses of up to 20 mg per day. Excessive doses in hyperthyroid cats may result in signs of hypothyroidism. This is however unlikely, as hypothyroidism is usually corrected by negative feedback mechanisms. Please refer to Adverse reactions. If overdosage occurs, stop treatment and give symptomatic and supportive care. Pharmacotherapeutic group: Antithyroid preparations: Sulphur-containing imidazole derivatives. Thiamazole acts by blocking the biosynthesis of thyroid hormone in vivo. The primary action is to inhibit binding of iodide to the enzyme thyroid peroxidase, thereby preventing the catalysed iodination of thyroglobulin and T3 and T4 synthesis. Following oral dosing in heathy cats, 5 mg thiamazole is rapidly and completely absorbed with a bioavailability of >75%. However, there is a considerable variation between animals. Elimination of the drug from cat plasma is rapid with a half-life of 4.5-5.0 hours. Peak plasma levels occur approximately 1-2 hours after dosing. Cmax is between 1.6-1.9 μg/ml. Following oral dosing in heathy cats, thiamazole is rapidly and completely absorbed with a bioavailability of >75%. However, there is a considerable variation between animals. Elimination of the drug from cat plasma is rapid with a half-life of 3.5-4.0 hours. Peak plasma levels occur approximately 1-2 hours after dosing. Cmax is approximately 0.8 μg/ml. In rats thiamazole has been shown to be poorly bound to plasma protein (5 %); 40% was bound to red blood cells. The metabolism of thiamazole in cats has not been investigated, however, in rats thiamazole is rapidly metabolised in the thyroid gland. About 64% of the administered dose being eliminated in the urine and only 7.8% excreted in faeces. This is in contrast with man where the liver is important for the metabolic degradation of the compound. The drug residence time in the thyroid gland is assumed to be longer than in the plasma. From man and rats it is known that the drug can cross the placenta and concentrates in the foetal thyroid gland. There is also a high rate of transfer into breast milk. Tablet container: Keep the container tightly closed in order to protect from moisture. Keep the container in the outer carton. Blister: Keep the blister strips in the carton. Tablet container: White polypropylene tub with white low density polyethylene tamper evident lid containing 100 tablets. Blister: Transparent PVC/Aclar - aluminium blister. Blister strips contain 25 tablets. Each carton contains 4 blister strips. Below are some recent questions we've received regarding Felimazole for Cats, including answers from our team. I currently buy felimazole from my vet, but would like to buy from you when I get his prescription food, but he has both 2.5mg & 1.25mg tablets and you only seem to stock the 2.5mg dose. Will you be getting the smaller dose any time? My vet had confirmed that they can write a prescription (for a fee). Will I have to get a scrip. from my vet every time I order? We have now added the 1.25mg tablets to the website. Your vet's prescription should state the total number of tablets allowed from that one document. We can supply up to that amount over any period of time, as long as the prescription is first used within the expiry date (usually 6 months from signature). Ideally you should ask your vet to write a prescription with several "repeats" authorised. Most vets are happy to write out a prescription which covers 6 months worth of medication. A few will write it out for 12 months. Some are very reluctant to write out prescriptions at all and will only write out a prescription for a small number, then charge you a lot for the written prescription each time you have to go back. It depends largely on how helpful your own vet is. We can only work from whatever document we receive. Felimazole how quick does it work? Before we see a difference in her symptoms? This normally takes a few weeks while your cat adjusts to the medication. At 18 years old your cat may well have reduced kidney function and other age-related disorders and reducing her thyroid hormone levels to a more normal level will affect her in lots of ways. It might take a period of time to work out the ideal dose of Felimazole too, so it is important to be patient but also monitor her progress. You will need to visit your vets periodically to make sure all is going well. This usually involves further blood tests ideally.